You hear Iguazu Falls before you see them. The sound of constant crashing sneaks up on you, slowly increasing in volume until you abruptly realise it’s drowning out the sounds of birds and insects around you. The source must be close, you think. Just a few more turns along the path between the trees and then the cascading curtains reveal themselves. Footsteps falter, exclamations are uttered, and eyes meet with the same look of awe. 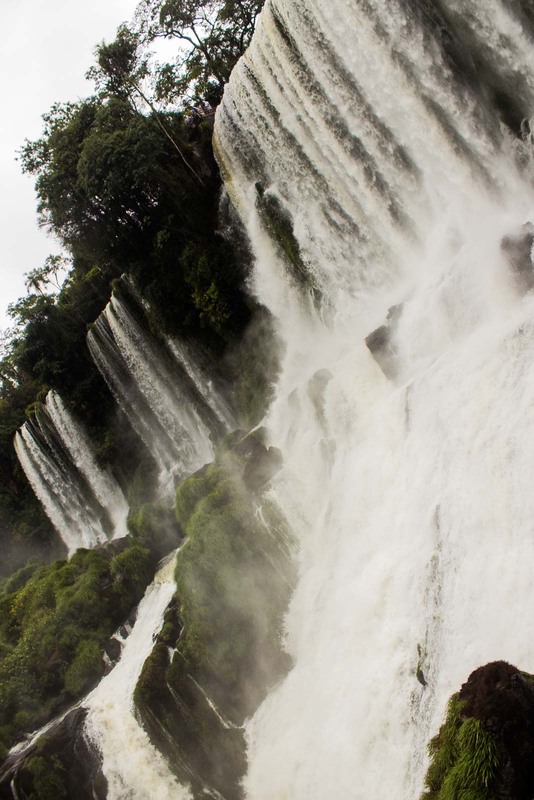 The waterfalls at Iguazu are before you and they truly are one of the most spectacular natural wonders on this planet. 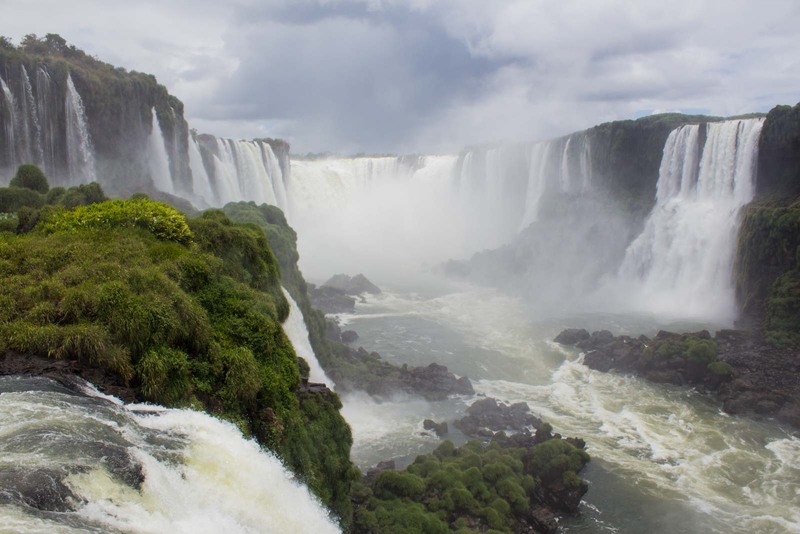 In fact, a few months ago the Iguazu Falls were named as one of the 7 New Wonders of Nature in a global competition. There has been some controversy about the process, as Michael Hodson detailed so well in this blog post. But regardless, there’s no denying that they deserve a place on any list of amazing destinations. The statistics speak for themselves. At the top of the falls, the water flows through a chasm called Devil’s Throat, which is 82 metres high, 150 metres wide and 700 metres long. Along the entire length of the site, there are about 275 waterfalls of various sizes. 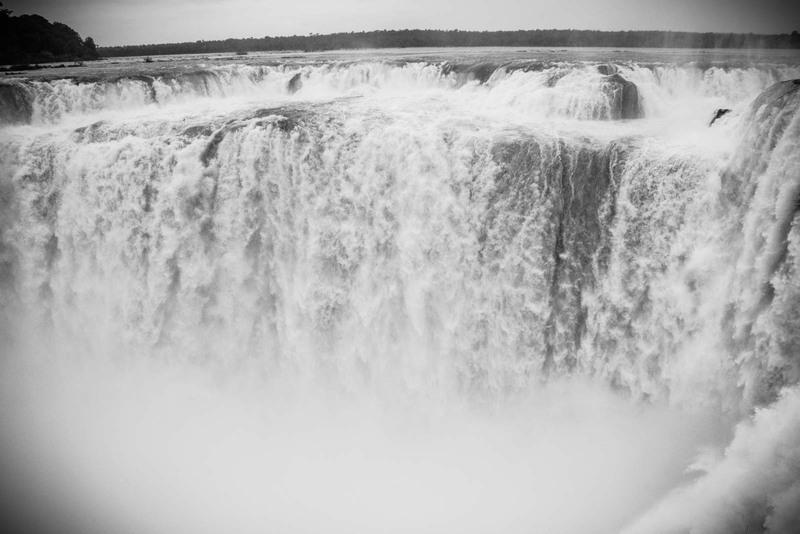 And the highest ever recorded flow of water was more than 12,000 cubic metres a second (if that figures doesn’t mean much to you just know that it’s much more than the highest flow ever recorded at Niagra Falls or Victoria Falls). 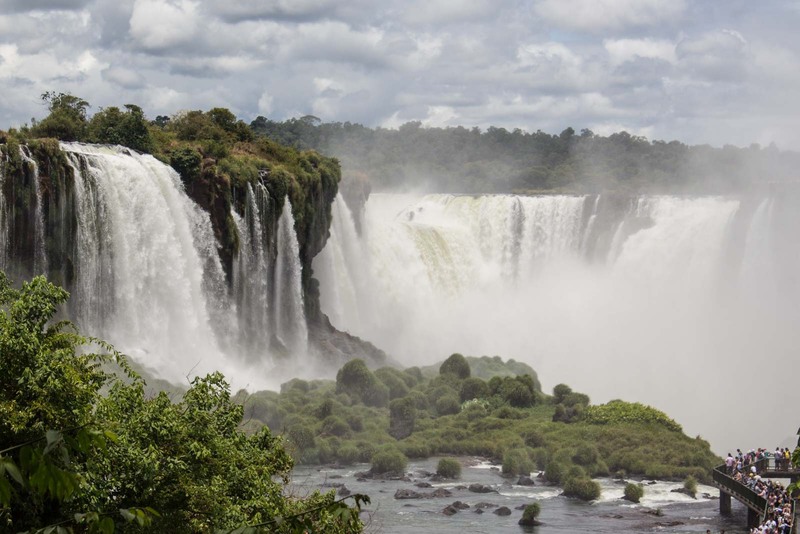 Is Brazil or Argentina better for Iguazu? 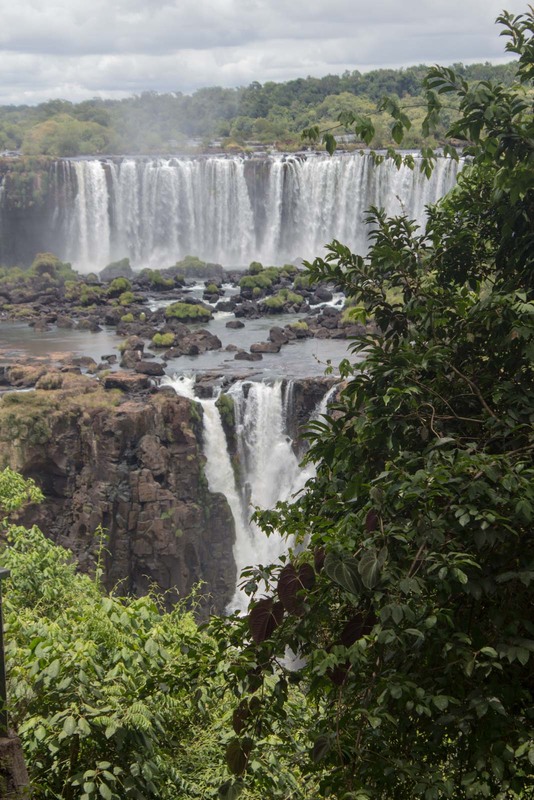 The facts and figures are one thing – seeing Iguazu for yourself is another. There’s no room for numbers when you have the immense power and beauty of nature so close. One of the constant conversations I’ve had, though, is which country is the best one from which to see Iguazu. The river system forms the boundaries of Brazil, Argentina and Paraguay. 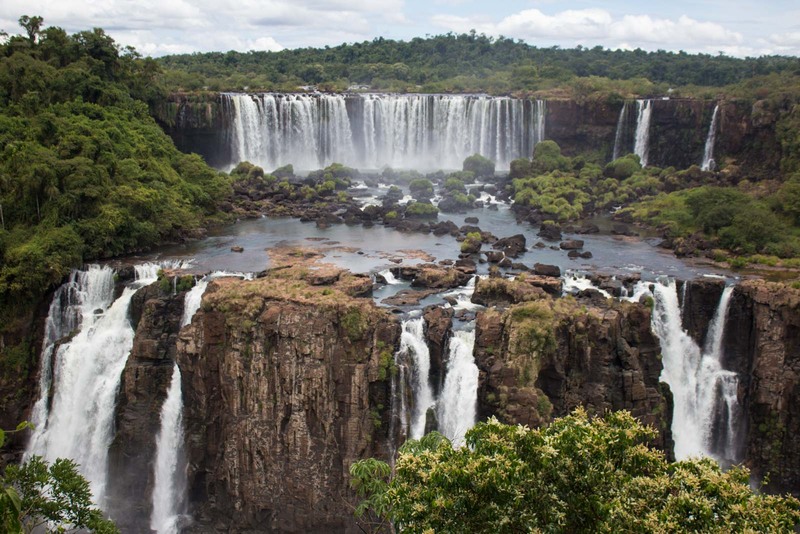 Poor Paraguay doesn’t really have a view at all but the other two nations have established amazing viewing opportunities and if you only have one day to spend there you pretty much have to choose a side. Most people I’ve spoken with say Argentina is the best choice. I, however, disagree. This may be as controversial as the 7 Wonders competition (although probably not) but I’m going to recommend Brazil. The Argentinian side of Iguazu Falls is nothing short of breathtaking, don’t get me wrong. About 80 per cent of the waterfalls are on the Argentinian side and the paths for visitors take you up close to the action. 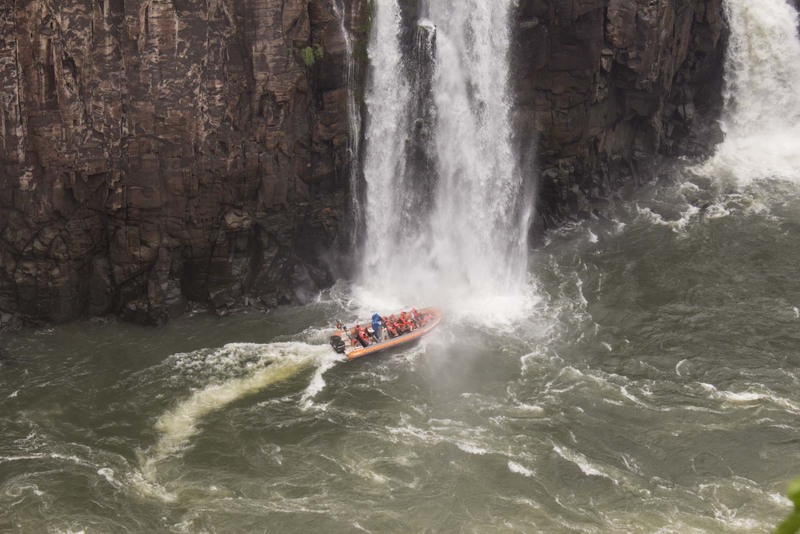 In fact, you can even take a boat underneath some of the waterfalls which is about as close as you could get (and as wet as you could get too, I can attest!). Standing metres from the cascades lets you experience the power of the water – you can feel the energy coming from it. And nowhere is this more the case than at the very top of Devil’s Throat where a wall of water, larger than you could have imagined, seems to come alive as the torrents plummet down from the river above. From the Brazilian side of Iguazu Falls, though, you get the overview of the whole waterfall complex and, for me, this is where the true awe lies. It’s when you realise the scale of not just the individual cascades but the entire system that you appreciate this experience. The white animation of the water contrasting with the brown cliffs, the striking clouds on the blue sky mimicking the colour of the water, and the green of the jungle bringing it altogether… it’s a photographer’s dream. I couldn’t stop my camera, it was like it had a life of its own, and from every new vantage point there seemed to appear new angles that needed to be captured. There is no right way to see Iguazu and there is no wrong way to see Iguazu. There is wonder, awe and amazement from every perspective. The most important thing, in my humble opinion, is to make some time in your life to go there and appreciate what nature can do. Some great photos. Looks like you had a good time. I saw Iguazu Falls from the Argentina side, and I can say without a doubt that it was one of the most incredible travel experiences I’ve had. I loved the walk through the jungle, and hearing the falls and feeling the mist before I actually saw them. Taking a boat right up to (and underneath) the falls was exhilarating as well. I didn’t go to the Brazil side, but I don’t think it could beat the Argentina side. Seeing both sides would make the experience that much better though, for sure. Yeah, feeling the mist and being so close to the water is definitely one of the best things about the Argentinian side. Hopefully you’ll get a chance to go to the Brazil side another time (any excuse to go back!!). I’ve been to Iguazu a couple of years ago and it was stunning. I stared at them from both the Brazilian and the Argentinian sides, from the top, from the bottom, from “underneath” when we had the boat safari that brought us almost under the fall, and they are awe-inspiring wherever is your location! Going on the water and ending up underneath the water is certainly a unique way to see them. But you’re right, they’re stunning from any angle. Wow. I have never been, but I have always looked forward to when we will. Those are some amazing photos that make me anticipate it even more. It won’t be a letdown, I promise! You can go to all the manmade tourist landmarks you want, but there’s something about nature that just blows you away every time!! Doing both is the perfect way to do it!! I went in 2009, and I was blown away. Much larger and more powerful than I was expecting. It’s hard to know what to expect, isn’t it. But it’s always better than you think it’s going to be, I reckon! I don’t think anyone goes there quite expecting it to be how it is. 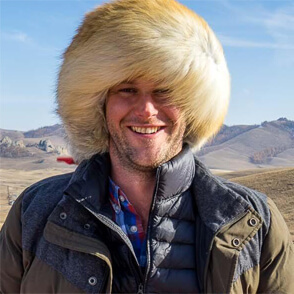 It’s pretty hard not to get blown away! I’m thinking of taking a side trip to the falls while I’m in Rio. How did you get there? How long did you say? What I guess I’m asking is, do you think it could be a long day trip or will it need to be an overnight trip? I would be flying, of course. If you were just going to do the Brazil side you could do it as a day trip – but you’d need to leave early and be prepared to head back late. You definitely couldn’t do both sides on the same day and fly there and back. You could stay overnight and do both, though. I’d say you need about 3 or 4 hours on the Brazil side (including the bus there and back from the ticket office) and about 5 or 6 hours on the Argentina side. Thanks for that information. It gives me a better idea before I put a lot of energy into looking for flights and such. Appreciate it! My pleasure. Shoot me a direct message if you’ve got any more specific questions about it. Hands down one of my favorite destinations in the world. Looks like you caught it on a pleasant day with good water levels! There was a lot of water (unfortunately coming from the sky as well). I can’t imagine it with low water levels. I’m sure it’s still spectacular but it wouldn’t have quite the power. Amazing photos and the narrative is spot-on. That’s one mighty and MAGICAL falls all right!!! Truly deserves the title of a “Wonder”! Definitely! I haven’t been to Niagra or Victoria but I find it hard to believe they could be better than this! I had no idea that these falls even existed. Now I have another place to visit! Definitely put it on the list for any South American trip. It’ll be one of the highlights!! 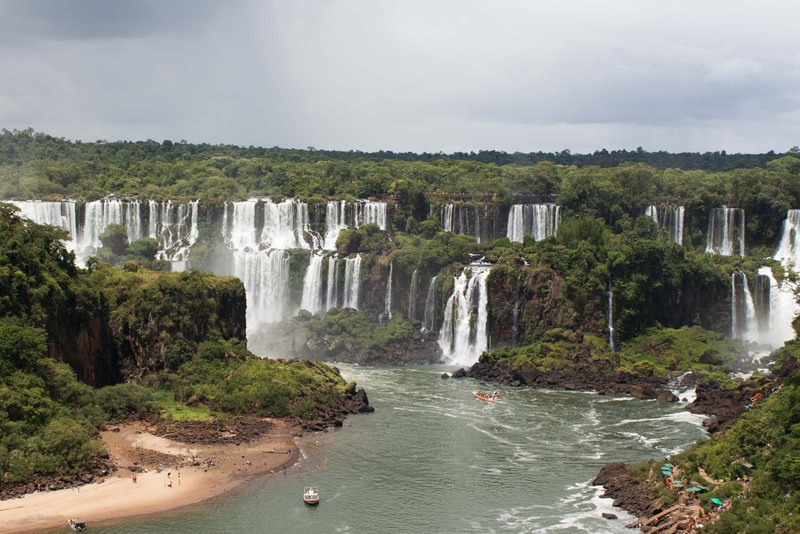 Nice post about the waterfalls at Iguazu. It’s definitely on our list. I appreciate your insights on which country to view the falls. I would rather have some distance to get a full appreciation of the waterfall system instead of being underneath it. Hopefully you won’t have to choose which side to see them from and you can do both! I am excited about our upcoming adventure to Brazil/Argentina. This will probably be our entry point from Brazil to either Paraguay or Argentina. You’ll love the falls! I went into Paraguay from there but getting into Argentina is really easy as well. You could pop into Paraguay for a couple of days and then go into Argentina, if you were interested. how many nights does it deserve to stay in Argentinian side? I would recommend a full day on the Argentinian side and half a day on the Brazilian side. That lets you cover it all pretty well. You could, of course, spend a bit longer on either side, but I don’t think it’s necessary. 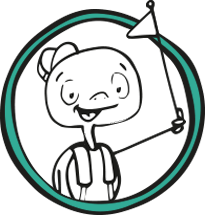 Hope that helps – let me know how you go! Great post and stunning pics! So, someone can easily stay somewhere closet to Iguazu in Argentina, take a day trip to the waterfalls, come back, and next day go to the Brazilian side? Which outfitter did you use and how did you pick it? Hi Stan. yeah, it’s very easy just to stay in one country and make the trip into the other one. I think staying on the Argentinian side is the best – I stayed at a place called Hostel Inn which was a nice budget place. There are lots of options, though. You can just use public transport to go to the Argentinian falls from there. To get to the Brazilian one, you can also use public transport. But if you ask your hotel you’ll also find there are heaps of bus companies that will take you directly to the Brazilian side and do the passport control for you. You don’t really need a tour guide once you get to the national park on either side. Good luck and enjoy! Truly one of the most beautiful natural sites I’ve ever seen!